Nancy Perkins is making a belated return to boarding school after an illness and immediately notices strange things happening. Her taxi is crossed by a teacher, who looks scared out of his wits and in a dreadful state before he disappears into a storm. Yet Nancy later sees him at school, looking perfectly normal and doesn’t know what she is talking about. Certain pupils and teachers act out of character – as if they were imposters. A pupil disappears without explanation. Nancy sees a procession of pupils and teachers heading off to Broughty Manor in the dead of night, although the headmistress has just put that place strictly out of bounds and has reminded the pupils about it twelve dozen times already. We soon learn that these people are the henchmen of “the master”, there is something non-human about their eyes, and they have some sort of affinity with plants. Realising Nancy is noticing too much, “the master” orders them to kidnap her and bring her to his lair at Broughty Manor. The master, Dr Bracken, explains that the Government and scientific community refused to believe his claim that he could heal people by combining plant serum to human flesh to re-grow body parts. Desperate to prove his theory, Bracken tested it on himself. But the attempt was premature, or so Bracken believes anyway. As a result, the entire left-hand side of Bracken’s body is plant, and now he’s a freak. Bracken blames the Government for his condition, so he is seeking revenge by overthrowing the Government and establishing himself as Britain’s ruler. The first stage of his plan is replacing everyone in the community with special plants that are grown as human clones. The clones are equipped with the brain-patterns of their human counterparts. These include all the staff at Nancy’s school and a considerable number of the pupils. What happens to the real people? They get fed to his man-eating plant, of course. Nancy makes a run for it, only to nearly fall foul of the man-eating plant when she stumbles into its layer. Bracken sees this on his monitor and laughingly leaves her to the plant. Fortunately Nancy realises in time that sudden movement attracts the man-eater, so slow movements will get her out. After that escape she stumbles into the greenhouse where Bracken grows his plant-people. She is revolted and sickened by this “people factory” and can’t get out fast enough. She did not notice that her own double was growing there too! Nancy breaks into the school to call the police. However, the plant people detect her before she can complete the call. She tries to escape down the ivy, but the plant people control all plants, which enables them to capture her by commanding the ivy to fall down. They tie her up in the infirmary. Fortunately Nancy’s friend Laura saw everything and gets her out. After Nancy explains what’s going on, the girls make a run for it together. As they do so, they discover that Bracken almost has the entire district under his control and realise the plant people have a power over other plants, including communicating with them. So it’s only a matter of time before they are caught and have to get right away. They see a plant man preparing truck to drive to London, which is where Nancy’s parents live. Nancy and Laura sneak aboard the lorry, and have to share a dreadful ride with incubating plant people. They can barely keep themselves from screaming. Nancy and Laura make it to Nancy’s house, only to find Bracken got there before them. He has kidnapped the parents and replaced them with plant clones. While trying to flee the plant people Nancy throws weedkiller at them, which destroys them. Now they know what weapon to use against the plant people. Laura is dispatched to alert the police while Nancy heads back to Broughty Manor to rescue her parents. The first thing Nancy encounters in the manor is her plant clone! Nancy smashes a pot plant into the clone’s lantern, which causes it to burst into flames. Nancy heads to the man-eater plant room where her parents are sure to be. Sure enough, Bracken himself is about to feed them to it when Nancy bursts in. Nancy shouts at her parents not to make sudden movements, a warning Bracken forgets when he draws a gun on her. Attracted by the sudden movement, the plant seizes Bracken and devours him. The police arrive (after Laura finally convinced them she was not crazy), but there is little for them to do except mop up. Fire has spread from the destruction of Nancy’s plant clone and is now burning down Bracken’s lair. The plant people just wither and die without Bracken to control them. So Bracken’s operation is now falling apart “like leaves in the wind”. Mad scientists who tamper with or abuse nature were a common staple in Misty. And this being Misty, they paid the price, usually in the form of nature striking back one way or other. Bracken is no different. First, he suffers grotesque but fitting damage to his body as a result of his own experiments and tampering with nature. Of course he never even considers it was his own fault for not heeding what must have been legitimate warnings. Second, he gets eaten alive by his own man-eating plant and meets the same end he had inflicted on so many innocents. In terms of weapons or credible invasion plans, the plant people are not all that strong. All you have to do is bring out the weedkiller or flamethrowers and they’re finished. I doubt they would stand up to bullets either. Or if you bring down Bracken himself, the plant people just keel over. The plant people are not good imposters although they carry the brain patterns and memories of those they have replaced. Sure, Bracken’s plan to take over Britain may look credible when he takes over the village and school, but that’s comparatively small and nobody except Nancy has caught on to what he’s up to. Taking over a whole country is vastly different and far more people would realise something’s wrong, and it would not take the army long to figure out the weaknesses of the plant people. The definite strength of this story is definitely the horror and repulsiveness of Bracken’s experiments, including what he’s done to himself. The incubation of the plant people is nauseating. The plant people themselves are frightening in their somewhat vacant, zombie-like stares, but their real strength is how they have all plants at their command. Imagine if you are at 10 Downing Street and suddenly all the plants outside turn hostile. Or you are a farmer and suddenly all your crop fields go crazy. Of course there is Bracken’s ultimate monstrosity – the monster-sized maneater plant he uses to dispose of people once he finishes with them. And let us not forget the horror of Bracken’s appearance. Half-man, half plant. Urrghh, what a bizarre, grotesque sight he is. One side of his body is perfectly normal, but the other side is wood, twigs, and leaves. You scream out the moment you see his appearance in full! The horror is all brilliantly rendered by the Maria Barrera art in such intricate detail and effective use of shadowing. I wonder if the Dr Who story “The Seeds of Doom” was inspiration for this story. It was aired three years before Body Snatchers, so it is possible. The story is so reminiscent of the Krynoid menace in the Dr Who story. The Krynoid, for those who don’t know, was an alien plant that not only eats people but also has the power to control other plants and make them turn hostile towards people. Both stories have a mad botanist out for conquest. Both mad botanists use ecological ways to dispose of people; in Body Snatchers it’s a maneater plant and in the Dr Who story it’s a compost machine. And wouldn’t you know it – both of these mad botanists meet their own gruesome ends by those very methods, which backfire on them. Of course “Invasion of the Body Snatchers” would be inspiration too. Curiously, the book the movie was based on was also called “The Body Snatchers”. Writer: this Tammy story is credited to Jay Over, who also wrote Jinty‘s long-running school soap opera, “Pam of Pond Hill”. As we will see, there are also a few thematic similarities between this story and others in Jinty, raising intriguing questions about what else Jay Over may have written in this comic. Plot: Alison Thorne is a talented dancer, but that’s not the main focus of her interest; she’s a very active girl who enjoys all sorts of things, such as art and socialising with her friends. Dancing is great fun – the first thing we hear from Alison is “Dancing makes me feel good from top to toe!” – but we also hear her think straight afterwards “I’ll have to get a move on if I’m to make it to the Youth Club on time!” In short, she’s a happy-go-lucky girl who isn’t driven by ambition or focused on talent. This isn’t a problem to her, or to her parents either, and it wouldn’t be an issue for most people. Her ballet teacher Miss Dempster, though, has ambitions on Alison’s behalf (and some ambitions for her own fame as a teacher too). 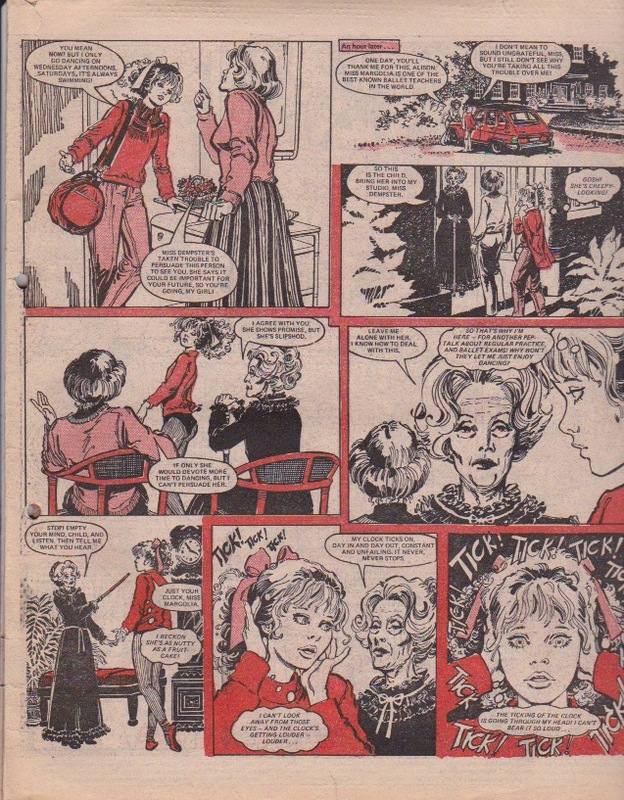 Dempster takes her pupil along to creepy Miss Margolia, who promptly hypnotises Alison so that the ticking of a clock will make her think of dancing… and only of dancing… as immediately shown when some friends come round to Alison’s house the next morning and put a clock to her ear to wake her up. Thereafter, any ticking clock will not only force Alison to dance, but also to lose awareness of her surroundings. That first time, her friends leave her dancing, because she pays no attention to them, and she doesn’t even realise they have been and gone. At the next dance class, Miss Dempster is annoyed and disappointed to see that Alison is still not giving her whole-hearted attention to the class, but then she doesn’t know yet what the real key to Alison’s slavery is – the ticking clock. Another player is about to join the story, though – a girl called Kathy, who has sadly been injured and cannot herself dance any more. Alison, fairly nobly to be honest, thinks to herself that she should be careful to take Kathy’s mind off dancing by focusing on other activities. Once again, a ticking clock – this time a wristwatch – makes Alison dance at an inopportune moment – this time, when Kathy arrives. Not surprisingly, all present think Alison is just showing off in front of Kathy, very cruelly. Alison’s parents don’t believe the wild story that the two girls bring to them, of course, but the two friends go off to find and confront Madame Margolia. But Dempster meets them outside the house, and tells them that Madame Margolia has been taken ill – and died! Will Alison never escape the curse of the ticking clock? Seemingly not – even if she is not dancing all the time, her parents are now resorting to taking her to hospital for mental treatment – and a sticking wheel on a hospital trolley triggers her off dancing again, so perhaps the curse is even getting stronger. However, it is in the hospital that they find Madame Margolia – seriously ill, but not dead (what a surprise to find that Miss Dempster lied – not!). Not that they can do anything to contact her, because Alison is whisked off to see the (very unsympathetic) doctor, who says that all this forced dancing is purely in her mind, because she is scared of failing her dance exams – and therefore her parents make her take more dance lessons, with – guess who? Miss Dempster of course. Alison pleads to do her exams with any other teacher rather than her tormentor, but her father replies: “Considering the cruel accusations you’ve made against her, I think Miss Dempster’s a fine person to take you back and help you.” So not only has she to face the cause of her problems, she even has to be grateful to that person?! That’s a nasty twist. In fact the lessons go surprisingly well, though of course at first Alison is trembling like a leaf and hardly fit to dance. Miss Dempster is feeling guilty again and forebearing to use the power of the clock, and Alison gradually relaxes more and enjoys dance again. Temptation falls in Miss Dempster’s path once again though – can she get Alison into the International Ballet School, where it’s been her dream to have a pupil? By now we know how weak la Dempster’s will is, of course. And yes, the climax of the story is that although Alison had started to happily believe she was cured of the dancing fits, instead she is once again made to dance, for her teacher’s benefit not her own. This time the International Ballet School judges clearly reject Alison’s mechanical, hypnotic dancing, making it very clear just how misguided Miss Dempster’s actions are on all fronts – and a surprise guest appears in the form of a wheel-chair bound Madame Margolia. Alison is finally cured, though Margolia and Dempster require the two friends’ silence as their part of the bargain. There is a last reward for faithful sidekick Kathy though – the limp she has had since her injury is psychosomatic, so Margolia is able to cure her of it with one last application of (benign) hypnotism. Thoughts: There are some silly aspects to this story – hypnotism is intrinsically an over-the-top trope, and this has the hypnotic subject nearly dancing to her death, which can strike the reader as absurd. On closer read, though, it is a pretty disturbing story, not to say chilling. The main feature of it is perhaps that it is a ‘grownups know best’ story: protagonist Alison is quite happy as she is, and there is objectively nothing wrong with her, but a grown-up has other ideas of what’s best, and rides rough-shod over the girl protagonist’s clearly-expressed desires and aims. Miss Dempster thinks that it is a waste that Alison doesn’t use her dancing talent; in just the same way, Susie Cathcart’s grandmother thinks that Susie should be using her intellect rather than her gymnastic skill, and so makes her into the “Prisoner of the Bell“. Similarly, headmistress Purity Goodfellow uses her mystic drug to turn the schoolchildren of Edenford into a paradise along the lines that she deems best – even if the girls need to be dragged kicking and screaming into the infirmary where she will administer the drug. I could continue with more examples – for instance “Battle of the Wills” also has a determined grandmother who makes her granddaughter practice hated ballet rather than the gymnastics that she loves, though no mind-control is seen in that story. It is not the most frequent story theme in this comic, but you can see how it would strike a chord with the readers. It’s striking not only that the girl character expresses her desires clearly and unmistakably, but also that the grown-up simply dismisses them as foolish, worthless, clearly unacceptable – and other grown-ups are likely to be persuaded into this view too, even if they had started out on the side of the (actually perfectly nice and normal) protagonist. Of course, the grown-up is pretty clearly shown not to have known best, in the end. As with Miss Dempster, their manipulations clearly fail on their own terms, and don’t produce the desired result even if they had seemed promising initially – free will does triumph over coercion, though it’s a long road in getting there. That’s pretty subversive to me, in a kids’ comic – it’s not just saying that grownups can get it wrong, but that they can positively be against you even when they’re not obviously evil. Dempster is very chilling – she is not as witchy-looking as Madame Margolia (a stately crone if ever I saw one), but she just doesn’t seem to care about Alison, except in flashes that are overcome all-too-easily. It’s a proper emotional abuse story, done quite strikingly. Dempster persuades herself that it’s for the right reasons, or that it will be worth it in the end, but not only does she ignore Alison’s stated wishes and aims, she disregards the pleas and the begging that the girl is driven to by the end. Lies and the use of her power for her own ends – Dempster does not look or act conventionally evil, never descending to cackling, but she is inhumanly self-absorbed nevertheless. Madame Margolia is far from innocent (quite apart from having applied the hypnotism in the first place, she also demands silence as her payment for taking it off, which is pretty much barefaced cheek on her part) but she can see the cost of the slavery much more clearly than her younger associate. If Dempster ever got the power to do hypnosis herself, I would be far more worried for the fictional world than with it staying in Margolia’s hands! Misty ends her run with #101, and there is “important news” (rather than the more usual “great news”) about her merge into Tammy next week. In the Misty message, Misty informs readers that she now has go back to the misty lands to fight dark forces. But so as not to deprive her readers of their spine-chilling stories, she is making arrangements with the Storyteller of next week’s Tammy to bring them, while at other times bringing them herself. She then refers readers to page eleven for the “important news”. All of Misty’s serials end in this issue, so there are no unfinished Misty stories carrying on in the merger. But this is not the case with Tammy: for the first issue of the merger, “Sister in the Shadows” will be on its third episode, “Cindy of Swan Lake” and “Daughter of the Desert” somewhere around the middle, and “Make the Headlines, Hannah!” on the penultimate episode. Misty readers must have been a bit annoyed to start reading unfinished stories (though it was all too common with mergers). Since Hannah was near the end, couldn’t Tammy have doubled her up a bit so she would finish before the merger issue, and perhaps hold off “Sister in the Shadows” for a couple of weeks to allow for it?